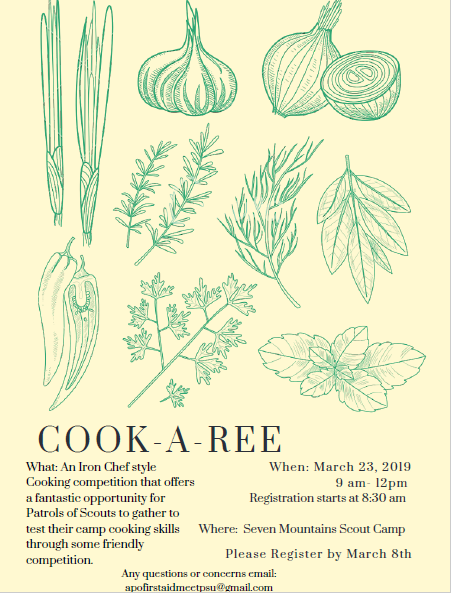 Alpha Phi Omega – Alpha Beta Chapter at Penn State is hosting a Council-wide Cook-a-ree for Boy Scouts and Venture Crews on Saturday, March 23rd at Seven Mountains Scout Camp Athletic Field. This Iron Chef style cooking competition is a fantastic opportunity for Patrols of Scouts to gather to test their camp cooking skills through some friendly competition. Check in will open at 8:30 a.m. with opening ceremonies to follow at 9:00 a.m. An allotted time will be given to prepare competition dishes that will be presented to judges. At noon, after the all patrols’ dishes have been judged based on criteria in Scout Handbook and Cooking Merit Badge book, trophies will be awarded to top patrols. Each Scout will receive an event patch. We look forward to seeing you there!